Hereditary diseases may be written in people’s DNA, but we are developing the power to rewrite their future. Through your tax-deductible donations to the Hereditary Disease Foundation, we can accelerate the urgently needed research breakthroughs towards the cure. Treatments and a cure for Huntington’s disease and related disorders – with your support – are within our grasp. We are glad to provide assistance on any gift appropriate for you – please call us at 212.928.2121 or email us at cures@hdfoundation.org. 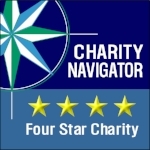 We are proud to earn a coveted 4-Star Rating of our Accountability & Transparency from Charity Navigator as well as a Platinum Seal of Transparency from GuideStar! The Hereditary Disease Foundation ("HDF") is committed to protecting the privacy of our donors. The HDF will not share or sell a donor’s personal information with anyone else, nor send donor mailings on behalf of other organizations. The HDF does not collect any personal information about individuals - such as names and postal or email addresses - except when such information is knowingly provided to us. Donations made via credit card are processed through GiveDirect, a donation platform for charities. GiveDirect provides convenience, security and customization for collecting donations online. All information collected by GiveDirect is securely processed and stored. GiveDirect takes many measures to protect the confidentiality and security of your information. They use encryption technology to ensure the safe transmission and storage of your information. GiveDirect shares personal information and donation amount with HDF, but no information is shared with third parties by selling, giving, trading or any other method. Users of this site will not receive unsolicited contact from third parties. You may need to give contact information (such as name and email address) and financial information (such as credit card number and expiration date). HDF uses this information for billing purposes and to contact you about the HDF-related topics. If you wish to subscribe to our email updates/newsletter(s), we will use your name and email address. Out of respect for your privacy, please send us an email if you would like to Opt-out and unsubscribe.